Why food prices are rising like hell ? Am writing this with immense anger over myself and my surroundings. Everyone should now be aware of the recent food prices soaring like anything. There are almost many factors that determine food prices around the world. The lacuna between the production and consumption has certainly widened. It is every individual's duty to know how he/she is responsible for contributing to this carnage. I already predicted this a year and a half before. The country's worst nightmare has come true. This definitely is a bright sign that this world is heading towards perdition. People who are reading this may not be directly influenced by the price hike at all, but its only a matter of time we are going to face the ramifications directly. Last week, I was supposed to go to a lunch with my team where the cost of a single buffet was 650 bucks! Is it really worth it? Definitely no! We should certainly realize that there are many people who cant even afford to their basic amenities which ofcourse is food. Now, why the hell should I pay that much to have a single lunch? Well, one can immediately counter that I'm not the one paying for it, its my organization. So, what ? Paying and having a nice team lunch is going to improve my rapport with the team, strengthening the togetherness bla bla, but the price I pay is too much, literally! The future is certainly doomed and this world is heading towards a direction beyond repair. Unless, each and every individual accepts that he is part of this catastrophe and act accordingly, definitely this world will come to and end soon. 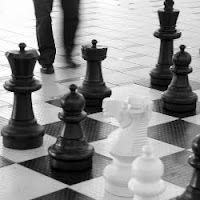 Although the opening moves in chess might have had a little impact on how the game is going to progress, the middle games are equally important as well. This is the period where players try to utilize their powers to the maximum. They try to bring out all their powers, the knights, bishops, rooks and ofcourse their ultimate weapon - Queen. Good players try to depend on all the powers rather on concentrating on one singe piece thus ensuring they cover most part of the board. Sacrifices are made during this phase of the game. The core purpose of making a sacrifice will be to gain a better position/mobility etc., Middle games often tells how competent you are on the board. Similar way during our second phase in life we tend to utilize our full potential, using all our possible powers may it be money, hard work, commitment or whatever it is we have. This is a period where risks/sacrifices will be made in an attempt to attain better position later in life. If you mess up in this phase, its game over!